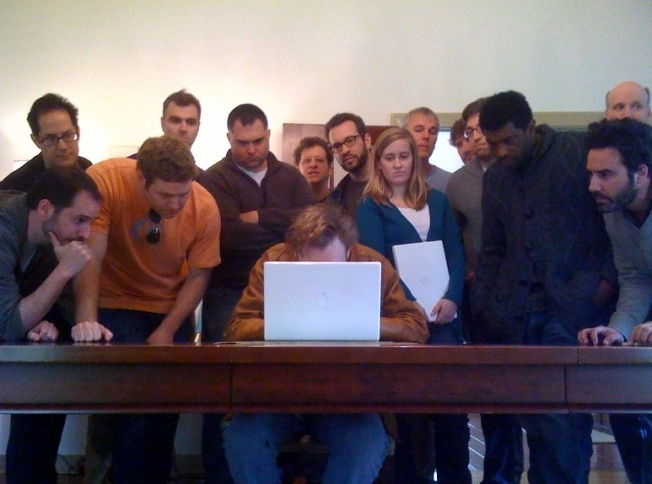 Conan sent a twitpic of his Twitter team. @ConansSharpie pointed out the similarities to another famous image. When Conan O'Brien joined the Twitterverse just over two weeks ago, some fans were a bit skeptical. When he had a show, the comedian had repeatedly made fun of celebrities' inane tweets. Is Conan just becoming another self-obsessed celeb? On the surface, yes: Some of @ConanOBrien's daily tweets seems straight from a TwitterTracker sketch on Conan's Tonight Show. But parallel to his official account, the former (and future, we hope) talk show host seems to have created a world filled with characters of his own invention. Taken together, the accounts amount to the most innovative celebrity Twitter campaign around. Meet Conan's Twitter world, featuring a cast of characters that would fit perfectly on his late-night show: @ConansMonkey, @ConansSquirrel, @ConansFreckles, @ConansTaurus, @CoCosBeard, @CoCosATMcard, @ConansSharpie and @KillensSquirrel (the squirrel of the one person he's following, Michigan's Sarah Killen). @ConansSquirrel: Umm. This is awkward. But those weren't raisinets. My bad. Sunday afternoon, O'Brien tweeted his Oscars plans: "Hey gang! Look for me at the Oscars tonight. I'll be in the parking lot, wearing my prom tux and listening on the radio." @ConansSharpie: Whew...I'm exhausted from signing all those autographs at the #Oscars. Thanks for showing up Max and the Band. @ConansTaurus: Conan, thanks for taking us to the #Oscars-aka Kodak Theater parking lot. What an after party! LaBamba is still passed out in my backseat. @ConansFreckles: So glad to have finally put Conan to bed. People were OK w/ his string dance atop his car but when he hit on the exiting Quentin-"Security!" We can't confirm that Conan is behind the Twitter legion -- only @ConanOBrien bears the official "Verified Account" badge. (It's not at all clear how Twitter would verify the account of an imaginary talking squirrel.) But Conan's tweets are clearly used to set up punchlines from the characters, and anyone familiar with Conan's comedy can see his fingerprints all over this scheme. Meaning, if O'Brien isn't writing these secondary accounts, it's highly doubtful he's not in on the joke. Most of Conan's Twitter fans are missing the joke. While @ConanOBrien has more than half a million followers, the characters are still relatively undiscovered. So lots of fans are missing comedic gems, like haikus from Conan's freckles, personal issues from Conan's monkey and existential dilemmas from celebrity facial hair. Even @ConansSquirrel, the first character (and the subject of @ConanOBrien's first tweet), has relatively few followers, with just 2,852. Poor O'Brien. It looks like the mass of America still doesn't get his jokes. It's not too late, though. Follow the entire Conan crew here.